This is another side dish I make very often. This is how I make this bhaaji with Okra. First chop the okra(3 inch sized) and microwave it for 3 mts. Preheat 2 tsp oil in a pan, fry the okra, adding that amount of salt required only for okra, to golden brown and keep it aside. In the mean time, grind onion, tomato,garlic, cumin, red chillies and salt (required only for gravy) to a fine paste, In the same pan, pre heat remaining oil, add the grounded paste, add turmeric powder and fry it till nice aroma comes out of the paste. Sprinkle water if necessary. Now add the fried okra to it and add 1/4 cup of water and let it cook for 3 to 5 mts. Add water to adjust the required consistency. Turn off the stove and garnish it with coriander leaves. This can be eaten as a side dish with chapathis, rotis or even with rice. Paru has tagged me for a MeMe. Thanks Paru. (a) List these rules on your blog. (b) Share 7 facts about yourself on your blog. (c) Tag 7 people at the end of your post by leaving their names as well as links to their blogs. I am a mom of twin 4 year old girls. I love to cook, play with my girls and make some simple fashion jewellery. I love to hear Illayaraja's hit songs of 70's, 80's and 90's. M.S.S. 's Meenakshi me mudham dehi, Chembai's Saarasaksha, Bombay Jayashree's Akhilandeswari, Sudha Ragunathan's RTP, Sanjay Subramaniam's Yaro ivar yaro are my favorite classical. I believe in god and I'm teaching my girls' some simple slokas now a days. My policy is "Take Life as it comes"
Recently became a United States Citizen. Soak channa dhall and red chillies in water for an hour. Grind it coarsely without adding water. Now add oats, chopped onion, salt,curry leaves, green chillies, coriander leaves and milk and mix it well. Make it small patties and fry it till it becomes golden brown. Serve it hot with tomato sauce. I have never tried molagootal with zuchini. But after visiting our relative's place, I wanted to try this time with zuchini. It came out really well and tasted good. Here is the recipe for molagootal. Pressure cook Moong dhall and toor dhall adding a pinch of turmeric powder and keep it aside. 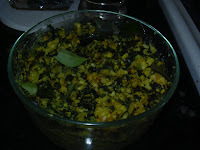 Take a pan, put zuchini, snake gourd, add required amount of water, turmeric powder, salt and let it cook for 7 to 10 mts. In the mean time, grind coconut, green chillies and cumin seeds to fine paste and keep it aside. Do not over cook the vegetable. When its 3/4th done, add the grounded paste and add required amount of water and let it cook for another 3 mts. Now add the cooked dhall to it and let it cook for another 3 to 5 mts. Take a small pan, pre heat oil, add mustard seeds, when it splutters add urad dhall, red chillies, asafoetida powder and curry leaves and let it fry till golden brown. Pour it on top of molagootal. Enjoy it with white rice. I made this payasam on Varalakshmi Nonbu. Here is the recipe I followed to make this recipe. I learned this from my MIL. Soak almonds and cahsews for half an hour in water (or we skip this by microwaving both for 3 minutes). Peel off the skin from almonds. Grind almonds and cashews into a fine paste. what I did was, i just added the grounded paste, milk and water and pressure cooked everything under low flame upto 2 whistles. When pressure is released, open the cooker, add sugar, cardamom powder and pachakarpooram and let it boil for another 15 mts. in low flame. Fry cashews to golden brown and pour it on top of payasam. Last week was a busy week because of Varalakshmi viratham, aavani avittam and Gayathri japam. I had to make different payasams for these three days. 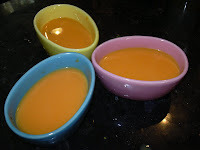 I made this carrot payasam on saturday. 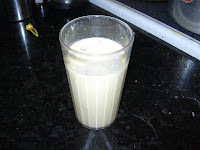 Here is the recipe I followed to make this payasam. Peel off the skin and microwave carrots for 4 to 6 mts. Let it cool and grind it finely. 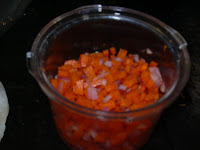 Just put this carrot paste in a pressure cooker, add milk and water and pressure cook in a low flame upto 2 whistles. By doing this, carrots will be fully cooked. We can even cook mashed carrots on stove top without pressure cooking. After pressure is released, open the pressure cooker, add sugar, cardamom powder, and pacha karpooram to it and let it cook for another 5 mts. under low flame. Pre heat ghee, fry cashews to golden brown. Add it to payasam. Serve it hot or cold. Srilekha and Dershana has passed me this Wylde Woman Award. Thanks Srilekha and Dershana. 1.You can give it to one or one hundred or any number in between - it's up to you. Make sure you link to their site in your post. 2. Link back to this blog site Tammy can go visit all these wonderful men and women. To send love and acknowledgment to men and women, who brighten your day, teach you new things and live their lives fully with generosity and joy. It's been a blessing and an inspiration to meet all of you through your wonderful blogs. I would like to pass this award to Sangeeta, Suganthi, Crissy, Kitchen Flavours, Gayathri Nidhi and Bhawana. 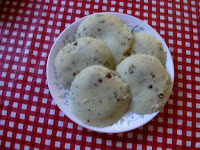 I usually buy ready to make rava idly pack and make idllies. This time I wanted to try by myself. Learned it from Gayathri's Check how to do? blog in which she has collected a handfull of useful videos. Here is the recipe I followed. Pre heat a drop of oil, roast sooji till it becomes pinkish brown. Let it cool. In the mean time, pre heat remaining oil, splutter mustard seeds, add channa dhall, red chillies, urad dhall, asafoetida powder and fry it till golden brown. Add it to the roasted sooji. 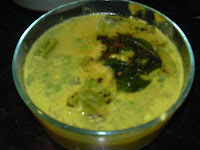 Mix finely chopped green chillies, ginger, curry leaves and coriander leaves with curd. Mix it well. Add it to sooji. Add salt and required amount of water to bring it to idly batter consistency. Keep it aside for an hour to two. 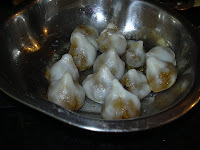 When you are ready to make idllies, spray oil in idly moulds, pour laddle full of batter in it and steam cook it for 20 mts. Serve it hot with some chutney. This is a traditional tiffin, my grandma used to make. She calls it koozhu dosai. 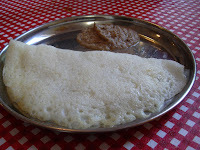 Here is the recipe for making this dosa. Soak raw rice in water for atleast 3 hours. Grind it into fine paste adding salt and required amount of water and keep it aside. Now after grind the batter, we usually clean the grinder or kalural (stone grinder) with water. The resultant water after cleaning the grinder will be white in colour because of the rice. Now we make koozhu with that water. So better use clean water to clean the wet grinder. Now take a pan, pour the white water in it adding two laddle full of rice batter, pour a drop of sesame oil, and stir it continuously till it comes to a semi solid stage. This is koozhu (it should be in cerelac baby food form). Now add this koozhu to the dosa batter and mix it well. 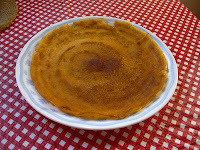 When you are ready to make dosa, pre heat a skillet, pour a laddle full of batter and make it a circle, pour a tsp of oil on the side and let it cook. Now flip it over and pour a tsp of oil again and let it cook. The main idea of adding this koozhu is, it softens the dosa. Try this with some chutney. This is something I made on Varalakshmi Nonbu. 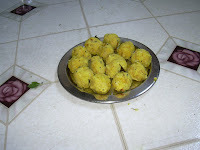 This uppu (salt) kozhakattai is different from what we make on vinayaka chathurthi. Here is the recipe I followed to make this recipe. Soak the above said dhall for an hour to two adding red chillies to it. Grind it coarsely adding required amount of salt, red chillies. Add 1/4 cup of water, a drop of sesame oil and turmeric powder and mix it well. Put it in a microwave safe vessel and microwave it for 6 mts. (stir it in between) till the lentils are cooked. Take a pan, heat oil, add mustard seeds, when it splutters add urad dhall, curry leaves and asafoetida powder and fry it till golden brown. Add the cooked lentils and mix everything well. Let it cool and make small balls out of it. 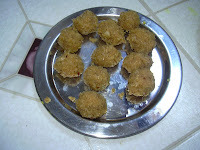 I love Jaggery kozhakattai. 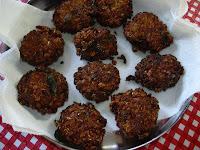 For varalakshmi Nonbu, I had to make these kozhakattais. Here is the recipe I followed to make this. Most of us use rice flour for making the dough. But the traditional way of making this dough is to use rice. Soak rice for an hour. 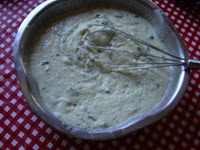 Grind it into a fine paste and add water to bring it to watery consistency (like dosa batter). Add salt and sesame oil. Take a pan, pour this batter and stir it continuously to make sure no lumps are formed. When the water is fully absorbed, it will come like a shiny ball. Turn off the stove, take it out of the heat and cover it with a lid. This is the flour coating we use for making kozhakattai cups. In the mean time, mix the jaggery, cardamom powder to coconut and put it in a hot pan, add ghee and stir it continutously so that all the water in coconut and jaggery is fully absorbed. This should again form like a ball without sticking in the pan. Remove it from the hot stove and let it cool. This is poornam. 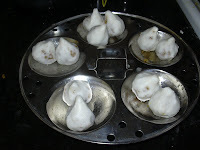 When you are ready to make kozhakattai, check the rice dough, if it is slightly dry, then sprinkle a hand full of hot water and knead it so that it becomes softer. Smear a drop of coconut oil, on your hands, so that it becomes easier to make small cups. 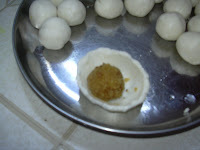 Make small balls out of the jaggery mixture, keep it inside the flour cups and cover it. Steam cook the kozhakattais for 15 mts. until its fully cooked. This is very famous evening tiffin in Kerala Iyer families. 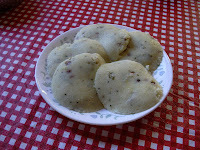 While making idly batter, we used to make this batter also without adding urad dhall to it. Here is the recipe. Soak boiled rice for 6 hours and grind it nicely adding salt to it and keep it outside for nearly 6 to 8 hours (this timing will be good in California ; if you live in Chennai, keep it outside according to your weather. If its too hot, then 4 hours will do). 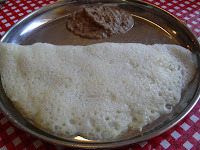 When you are ready to make dosa, heat a iron skillet(preferable) pour a laddle full of batter and make it a circle, now sprinkle the grated coconut and whole pepper on top of it. Pour oil on the side and let it cook. Flip it over and pour the remaining oil and let it cook the other side also. Remove it when it is fully cooked. Eat it with sambar. Chutney may not be good for this dosa. 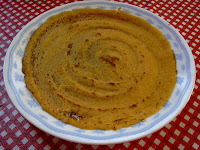 I personally like to eat this dosa with Brinjal poricha kozhambu (kerala style). Most of us like this thokku and also know how to make this. 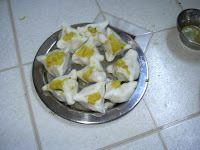 I follow the recipe of my aunt who is very good at making this thokku. 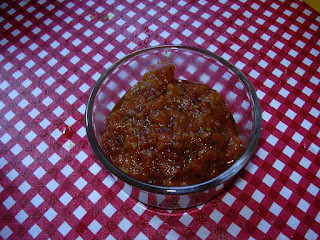 Here is the recipe for making tomato thokku. First wash the tomatoes and put it in hot boiling water. Cover the lid and let it be there for 3 mts. After 3 mts, take it out, let it cool and peel off the skin. Mash it nicely with a spatula or grind it in the mixie (its optional to grind; mashing itself will work). Pre heat oil in a pan, add mustard seeds, when it splutters add urad dhall, red chillies, asafoetida powder, turmeric powder, red chillies powder and salt and fry everything for couple of minutes. Now add the mashed tomatoes to it and mix it well with the ingredients. Reduce the heat to medium and let it cook for 5 to 7 mts. If necessary sprinkle a hand full of water on it. Now add the jaggery *** and mix it well. Let it cook for another 3 minutes. It will come like a thick paste and oil will spread out of the ingredients. Now turn off the stove. Let it cool and store it in a airtight container. This can be refrigerated and used for atleast a week to 10 days. This can be wonderful sidedish for Idly, dosa, chapathi and we can also spread this in bread slikces along with butter and eat it as a sandwich. It will be really good (my personal experience). *** - Adding jaggery is optional. Some people (like my husband) may not like spicy items and especially red chilly powder. In order to compensate the spiciness, I add jaggery. We can also make this thokku without adding jaggery. This is how we make mango pachadi in my mom's place. In every kerala Iyers' family, we use coconut for most of the recipes. Here is the recipe. First fry mustard seeds (given in ingredients), coconut and red chillies to golden brown. Let it cool and grind it into a fine paste. Take a pan, put the mangoes, add required amount of water, turmeric powder, salt and let it cook till the mango becomes tender. Now add the grounded mixture to it and let it cook for another 3 mts. Add jaggery and let it cook for another 2 mts. Let everything mix nicely together. 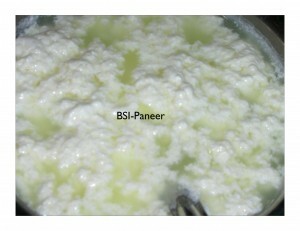 In order to adjust the consistency, mix the rice flour with 2 tbsp of water and pour it on top the pachadi. Turn off the stove when the required consistency arrives. Take a pan, pre heat oil, add mustard seeds when it splutters add urad dhall, asafoetida powder and curry leaves and fry it till golden brown. Pour it on top of pachadi. This is the easiest salad I have ever seen. 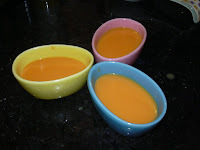 This is something I make everyday without fail so that my girls can eat carrot. Here is the recipe. 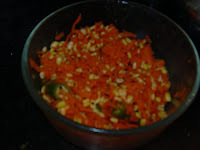 Mix carrot, onion, red raddish, salt, green chillies and lemon juice and shake everything well. Preheat oil in a pan, splutter mustard seeds and pour it on top of carrot mixture. This is a easy salad we can make everyday. I usually just mix everything and never season it. Seasoning is really to increase the taste of the salad. This is something I make very often whenever its mango season. 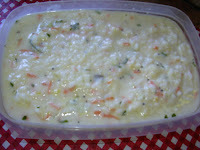 This is very good side dish for curd rice. Here is how I make mango thokku. First peel off the skin from the mango and cut it into small cubes. Microwave it for 2 mts (this process is optional if we microwave mangoes, it may take less time to cook on stove top or we can directly cook on stove top). Pre heat oil in a pan, add mustard seeds, when it splutters add asafoetida powder, mango, required amount of water, turmeric powder, red chillies powder and salt and let everything cook for 10 mts till the mango becomes tender and mushy. Oil will spread out of the mango. Now add jaggery to it and mix it well and let it cook for another 3 mts. This thokku should not be watery. When it comes like a ball, turn off the stove. Now sprinkle the fenugreek powder*** on top of it and mix it well. Now thokku is ready to serve. 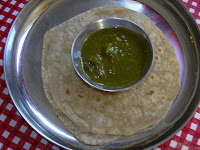 This is a wonder full side dish for curd rice, chapathi, or rotis. 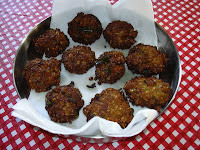 *** - fry 2 tsp of fenugreek in a dry pan, to golden brown. grind it into a fine powder and store it. This can be used as a medicine for mouth sore. This is something I learned from a magazine. Here is the recipe for making tomato dosa. Soak Rice and dhall for an hour adding red chillies to it. After an hour, drain it, add tomato, ginger, salt, coconut and grind it into a fine batter. This batter should be like dosa batter. When you are ready to make dosa, just heat the skillet, pour a laddle full of batter and make it a circle. 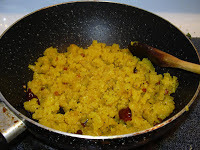 pour 1 tsp of oil or ghee on the edges and let it cook in a medium flame. When its cooked, flip it over and pour the remaining oil or ghee and let it cook. If you want more crispier, then let the dosa be in the skillet for another 2 mts under low flame. Enjoy this with chutney or sambar. I got tagged by Sangeeta and the title of the tag is 7 facts about Me. Work:- I worked for just 9 months after college and got married. Education:- I have a bachelors degree in commerce and a professional degree in tax. But I personally think I am still a student learning phonics from my 4 year olds. Friendship:- For which i can do anything. I love my friends and have a long of friends from my school, college, work and here in USA. Dreams:- I don't dream much. Because my policy is "take the life as it comes". Please pass this tag to your friends !!!!!!!! This is another version of spinach, i make very often. Since the ingredients used in this recipe are very handy. Here is the recipe. I finally logged in to my blogger account and thought of editing this post. I made this pulima yesterday for my dad. . 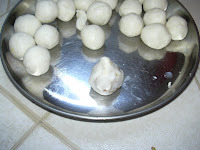 Here is the recipe for making pulima. 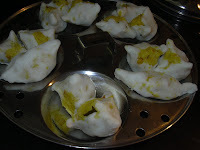 First take the rice flour, add salt and turmeric powder to it. Add required amount of tamarind water (more or less than 2 cups) and make it a smooth paste. Now pre heat oil, add mustar seeds, when it splutters add urad dhall, red chillies, curry leaves and asafoetida powder and fry it till golden brown. Now add the rice flour paste and stir it continuously till the flour fully cooks. The paste will scramble if its fully cooked. Reduce the flame and sprinkle a hand full of water and cover it with a lid for 2 mts. Again open and stir it. Let it be on the flame for another 2 mts. 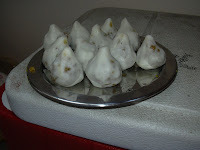 This can be a evening tiffin and can be eaten with a dallop of yogurt. This is very easy to make and spicy lovers will love this. I give spinach to my girls everyday. So I have think something or the other to make them eat spinach. I make spinach curry, spinach with dhall, spinach kootu etc. This is the recipe I followed to make spinach usli. First soak channa dhall, urad dhall, toor dhall and redchillies in water for half an hour. Thaw the spinach (if you are using frozen box) and cook it for 5 to 6 mts. Drain the water and keep it aside. When the dhall is ready after soaking for 30 mts. grind it coarsely. Add a little more water to the dhall, add turmeric powder and steam cook it for 15 mts. It may take 15 mts for the dhall to cook. When it is fully cook, scramble it and keep it aside. Take a pan, pre heat oil, splutter mustard seeds, add urad dhall, asafoetida powder and curry leaves and fry it till golden brown. 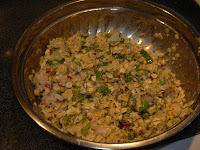 Now add the scrambled dhall to it and fry it for a minute or two. Add the cooked spinach to it and mix it well. Add salt now and mix every thing well and let it on top of the stove for another 3 minutes. Serve it hot. This can be eaten as side dish or as a main dish with white rice. I am not an expert in making north Indian dishes. But I like to give a try. This is something my MIL told me over phone and I tried yesterday. It came out well. Here is the recipe. Now thaw the frozen spinach and keep it aside. Chop onion, tomato, garlic, green chillies and ginger. Take a pan, add 1 tsp oil (can also use ghee) and fry the paneer pieces to golden brown. Keep it aside. In the same pan, add the chopped ingredients and saute until it becomes tender and a nice aroma comes. Let it cool. Now take a blender, grind spinach and the fried ingredients to a smooth paste. Preheat the pan, add butter, asafoetida powder and cumin seeds, when it crackles, add the grounded paste. Add a little water, turmeric powder and salt and let it cook for 5 mts. Now add the whole milk, rice flour mixture and mix it well. Let it cook for another 5 to 7 mts. Now add the fried paneer pieces to it. Add little more water if necessary and let it cook together for another 3 mts. When everything mixes together, serve it hot with soft rotis or chapathis. This Palak Paneer recipe goes to BSI event, this 95th week - BSI - Paneer, hosting by Ruchika. I always like to eat seasoned curd rice. My mom used to make this every weekend. I learned this recipe from my MIL. 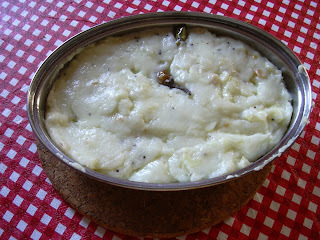 I made puliyogare, coconut rice and this curd rice on saturday for aadi perukku. Here is the recipe. First pressure cook rice adding 6 cups of water. When the pressure is released, open the cooker and mash the rice, if necessary add the hot water and mash it. Add the above said, yogurt, buttermilk, cucumber, carrot, green chillies, ginger, salt, grapes, and sour cream and mix everything well. Add water if necessary to adjust the consistency of the rice. It should be creamy. Take a pan, pre heat oil, add mustard seeds when it splutters add cashew, asafoetida powder and curry leaves and raisins and fry it till golden brown. Pour it on top of the rice. Mix it well. Garnish it with coriander leaves. 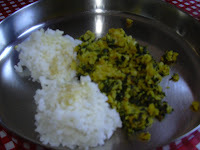 Enjoy the rice with more molaga (curd chilly).